A Wistful Farewell to Youth – Beethoven’s Tempest, Sonata Op. 31 No.2 III. Pianist Louis Kentner referred to the final movement of Beethoven’s Tempest sonata as “A wistful farewell to youth”. This is an appropriate observation, especially considering the ending, which vaporizes and slips away without warning. The feeling of youth in this work is expressed through a perpetuum mobile, a driving and persistent grouping of 16th-notes that barely ceases for even a beat throughout the entire piece, blazing on and rarely looking back. 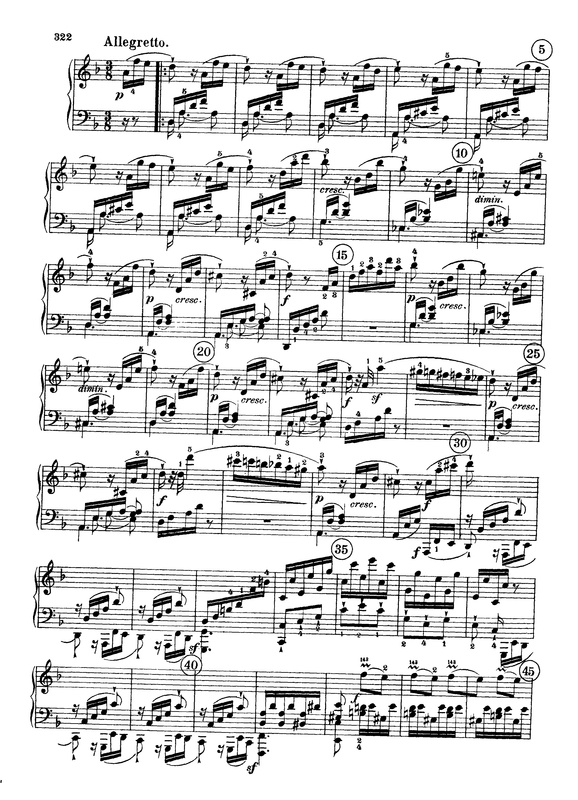 The first two movements of this sonata are in a sonata form (though the second movement is lacking a development) and this movement follows suit. 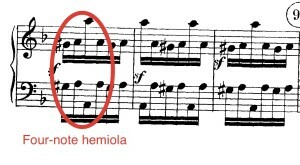 Perhaps the most unique aspect of this piece’s sonata form is that it is also a perpetuum mobile as mentioned above. This helps obscure the divisions of thematic material and makes the piece, at first, seem as if it’s organically developing without structural divisions. But make no mistake, Beethoven’s structure is just as meticulously designed as any other standard sonata-allegro form from his catalogue. The opening theme is a four-note motif that outlines the d minor chord in the right hand, and the left hand has its own four-note motif outlining the same chord. 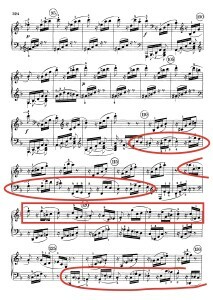 The way Beethoven phrases these motifs, requires the performer to pay special attention to pedaling so as not to lengthen the first beat of the RH (which is tempting though he marks this as staccato). This issue of a detached first beat is notated in the LH as well since he goes to the trouble of double-stemming the first LH notes, further emphasizing the point that this first beat must not linger through the measure. By measure 9, this LH motif changes slightly so that the first beat is sustained, but the RH continues its aforementioned phrasing. This creates an interesting and subtle textural shift as the music progresses. Beethoven follows a fairly standard key-schematic of moving from the tonic (d minor) into the minor v (a minor) by the second theme. You can see the second theme begin at the third-to-last measure in Ex 1. It begins with a trill which repeats 5 more times before moving on, which feels like an anxious, throbbing heartbeat. The development passes the four-note motif around between the hands and ultimately ends up all the way into b-flat minor, certainly an unexpected twist for its time. 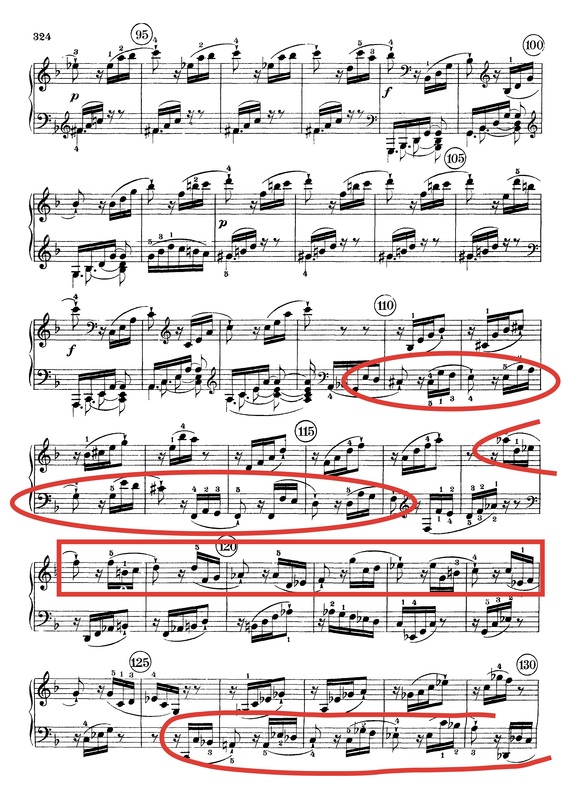 You can see the motif circled in red in Ex 2 as it gets passed from hand to hand, flipped upside down, and varied to outline different chord inversions. 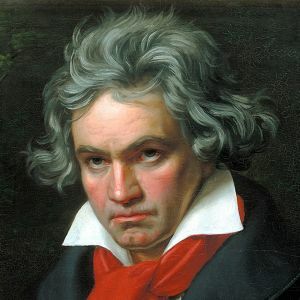 Beethoven doesn’t offer any suggestions on dynamics here and doesn’t notate the motif in any way which might help the pianist understand how to give extra consideration for voicing this motif differently than its partnering accompaniment. The ending of the development occurs in a similar way to the ending of the exposition. He uses a technique he frequently employs when moving back to the main theme in order to add more drama— a rhythmic tension which is sometimes found in the use of accents on off beats or through the use of hemiolas (rhythmic divisions suggesting other meters). 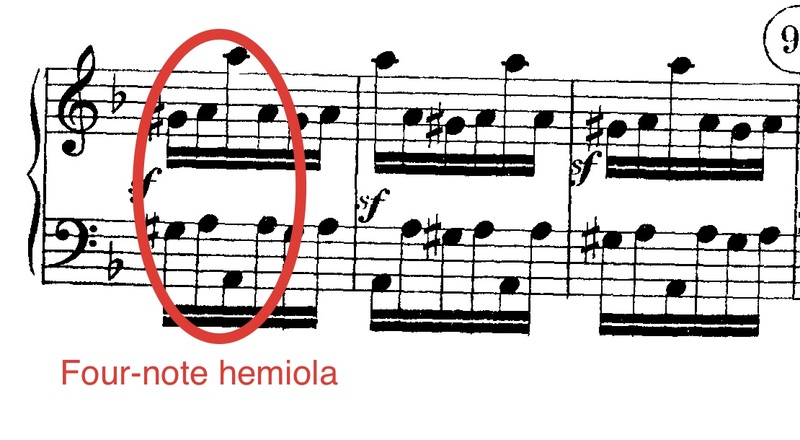 Here he uses the latter, the hemiola. He still places accents on the strong, first beat of the measure, but he tosses the recurring four-note pattern within a 3/8 measure, using the four notes in a space divided in a way where six notes can fit. Compare the exposition’s ending, Ex 3, to that of the development, Ex 4. The recapitulation’s coda briefly climaxes before vanishing as if time has slipped through our fingers. 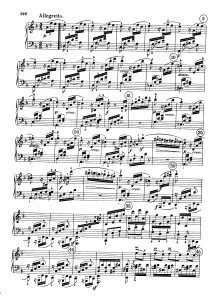 Beethoven became fond of this style of soft ending for his sonatas. Though he uses strong tonic chords as an emphatic stamp of an ending in several sonatas, he used the soft vanishing ending more frequently than his contemporaries and predecessors like Haydn. This ending has the effect of making the music, or perhaps the atmosphere and energy of the music, continue beyond those final notes. A powerful performance can use that ending silence in such a way that the emotion of the music lingers in the air. Here is a version I recorded the today as I practiced for my upcoming recitals.